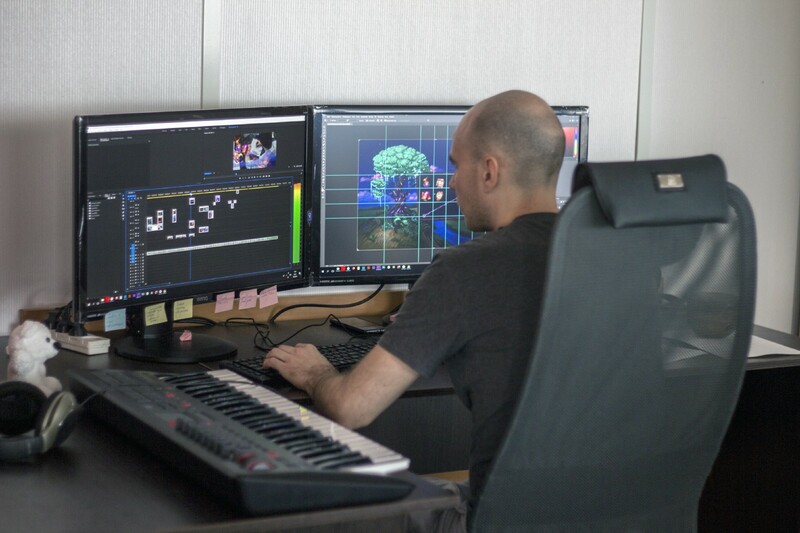 The process of the creation of any computer game begins with the concept development. At this same stage the game design is thought out and the background is outlined. From the very beginning we wished to create a unique product, therefore we have decided not to treat the subjects of cartoons, popular films or books. Hackneyed game plots like Aztecs, Ancient Egypt, pirates, vikings etc. were out of the question. Both you and we are fed up with these stories. We desired to create something unusual, something magic. Now I cannot even tell you when the idea to make a game about a tree was born. It was not our primary intention to associate it with the Scandinavian mythology, the name came much later. We planned that the tree would grow, blossom and change in the course of the game. Then we decided to add some magic to it. So the game about a magic tree was born. 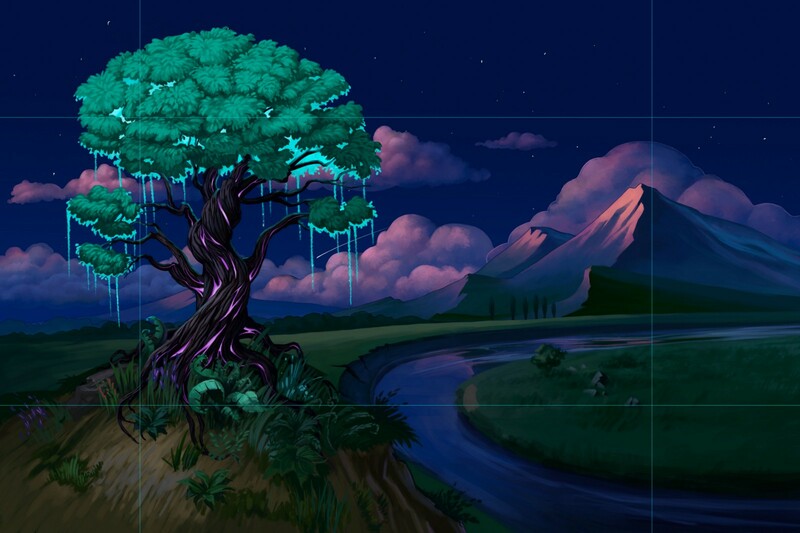 After the general direction of the game development became clear, the game artists started to draw the background and the tree. We decided that there would be some levels in the game, at each of which the tree would change its shape. Artists began to draw the basic elements — 12–15 symbols connected with the forest life (plants, leaves, berries, mushrooms, animals, etc. ), some magic symbols and bonuses like additional “major symbols”, Free Spins, Wilds and Scatters. At that stage the FairWin artists created the background and drew the tree. When it was decided to make a game about a magic tree there arose the question of how to name the game. Here mythology came to our aid. Almost all nations of the world have a myth about a universe tree. Ancient people envisioned the Universe as three worlds — the world of gods (the top world), the kingdom of the dead (the bottom) and the world of people (the middle). The magic tree is called Yggdrasil in the Scandinavian mythology. Thus the game about a magic tree acquires its name — Yggdrasil. At the same stage we developed and animated a lobby (the game menu) and started to finish the details. As it is not the first year that we have been engaged in game development, in creating the Yggdrasil game we used our previous developments on HTML5 and WebGL. The unique difference of Yggdrasil and the previous slot games that we created consists in that it is our first game on blockchain. That is, the deposition and withdrawal of funds from the player`s wallet will be done in the blockchain system, and all game turns will take place within our special FairChannel. How a blockchain casino works and how it essentially differs from the usual online casino games, we have already told you in detail. I will only mention here that the technology of blockchain guarantees the players honesty of winnings and that any player can be convinced of it. The blockchain stands for a digital register which is used to record transactions with the use of cryptocurrencies. All transactions in a blockchain are registered sequentially, are accessible publicly and invariable. Before a game is released there is a beta version of it which includes a completely working game process. Initially we planned to release a prototype prior to the beginning of the pre-ICO (on March, 11th). But due to our dragged-out development process we were compelled to postpone the launch of the pre-ICO until the prototype release. The prototype publication is called the Vertical Slice. The prototype will include all basic game elements and main features of the game. As we have already noted, in the course of the game there will be some levels — the growth stages of the tree. There will only be three stages in the prototype. The final version of Yggdrasil will include all bonuses, elements and game features. 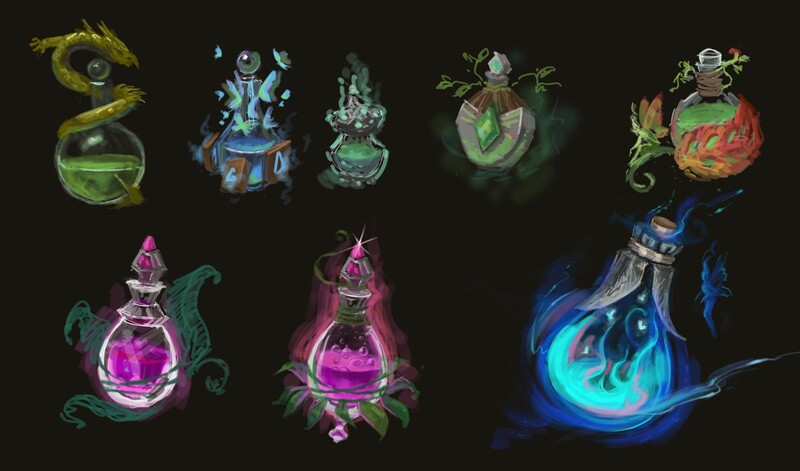 Among the bonuses there will be new magic elements which have not been accessible earlier and some animation clips. After the publication, the prototype will be accessible to any interested person on the site of FairWin. At this stage it will be important for us to receive some feedback from players and experts of the industry who will familiarize themselves with our product. On the basis of their wishes we will finish the game mechanics, create the features and bonuses and correct bugs. For us the beginning of this stage is connected with the beginning of fund raising during the ICO. Game testing continues at this stage, but this time with a wider audience. We will optimize the game for the heavy network traffic. At this stage the development of all features will completely come to an end, and the programmers will only be engaged in debugging and the improvement of features. It is the purpose of any game manufacturer — the launch of the definitive version of a game and the game sale. At this stage the definitive variant of a game will be accessible to organizers of gambling and online casino owners. The team of developers will correct the last technical bugs, revealed during the operation and product optimization.